Winter fishing has remained very strong even in a blizzard. 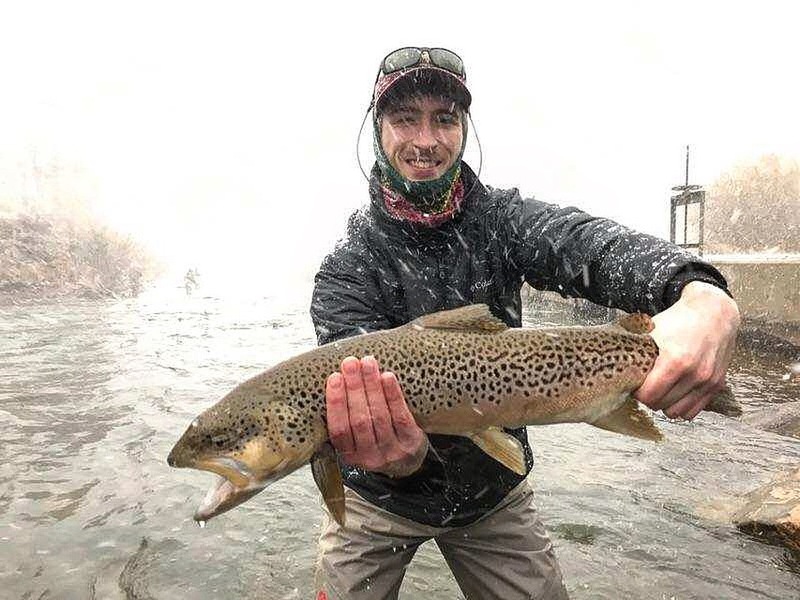 Sam landed this 26 inch Brown in the brief blizzard we had a few days ago.The secret fly was a custom tied Zebra Midge that his guide, Tom Caprio, supplied. Tom guides for 5280 Angler. Their guides are at Boxwood a lot so they know where these monster fish hide out. We still have great water at 140cfs and gin clear. Really large fish in the 26 -30 inch size are being landed on almost every trip.Some of the larger fish are breaking off. Check with one of our Authorized Outfitters and book a winter fishing trip at Boxwood.You get to fish nearly 3 miles of private water and enjoy the comforts of our clubhouse for a special winter rate.